Leo loves to play, and if you were to see our house at this present time you would see that he has more than enough to play with. But Leo is actually role playing, he is using his imagination to play make believe games. I thought he was a little too young to be doing these things but the more I think about it the more I realise that it is a learnt behaviour. He watches me talk on the phone, so he talks on the phone. He has seen me vacuum the floor, so he does it too. Everything he does he has seen done at one point or another. 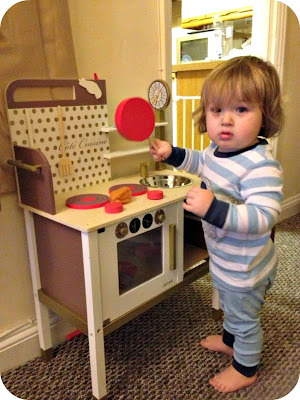 For Christmas we got Leo a wooden play kitchen, it is something that we had been wanting to get for him for quite a while. The main reason I knew he would love the kitchen is because of the doors. Yes…My son has an obsession with opening doors putting objects in and out and then closing the doors again before repeating. So I knew that what ever we did get him would have to be strong and sturdy, as Leo was going to play… hard with it. 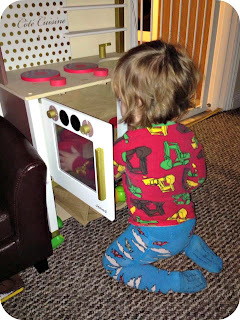 As expected the kitchen has been a big hit and by far his favourite Christmas present, he stands with his kitchen utensils and cooks porridge on the hob, and stirs it so effectively. Leo will then bring me over the yummy bowl of steaming porridge (or orridge as he calls it) and of course the spoon so that I can eat it all up. Of course I make the appropriate eating noises to let him know that he has cooked up one mean bowl of porridge, and usually after I have eaten my fair share, Leo will chow down on the rest making the same eating sounds and dipping the spoon in and out of the bowl. I have told Leo that the pots and pans can get very hot so he has to be careful while he is cooking on the stove, and understanding exactly what I have said he touches the pans and then puts his hand to his mouth. Strange as this sounds this is what Leo does when he touches something he expects to be warm or hot such as the radiator. To go alongside the kitchen Santa brought Leo lot’s of pretend food so that he would have lot’s to cook up for Mummy and Daddy. 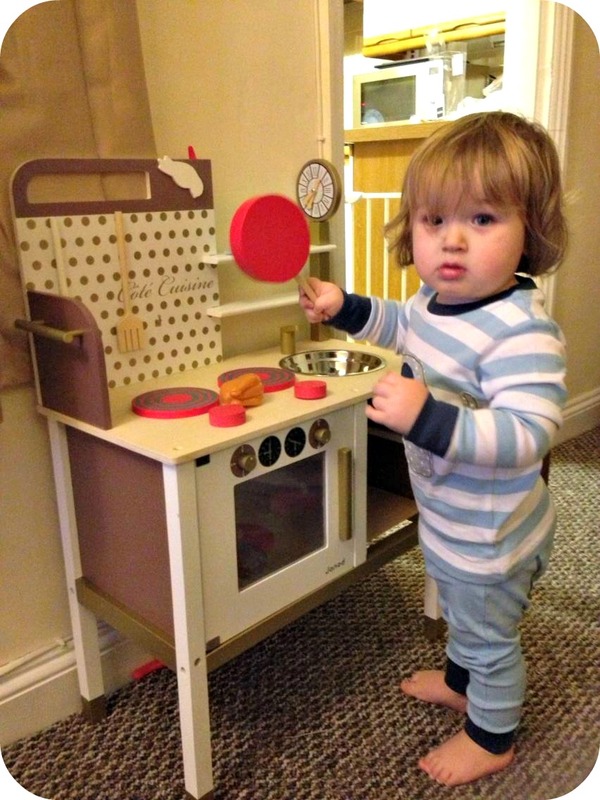 Sure enough little man is roasting chicken and cooking up delicious vegetables in his oven, and the more he plays and we say the names of what he is cooking, the more he is learning to say. He tells me ‘pizza’ and points into the oven, and sure enough…His plastic pizza is cooking in there. Of course when the pizza is all cooked up we must eat it up very quickly with our enthusiastic ‘yum, yum’ noises. Leo will whip out his very own Dyson hoover to clean up the mess that has made on the floor, whizzing it backwards and forwards with his very own ball technology! He especially loves to help Mummy clean up the house, and the best thing is that now he has his very own…He doesn’t cling onto my Dyson…and he doesn’t try to sit on it to go for a ride! Leo also has his very own baby boy doll, we have named him Josh in honour of his baby cousin. I think that Leo believes all baby’s are named Josh or as he would say ‘osh’. 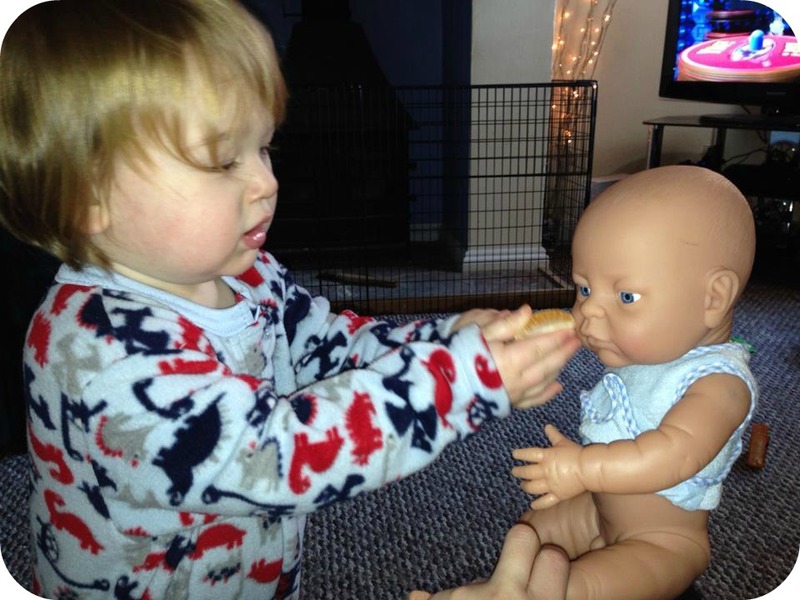 But we have to sit and feed Leo’s baby doll with his very own doll bottle. 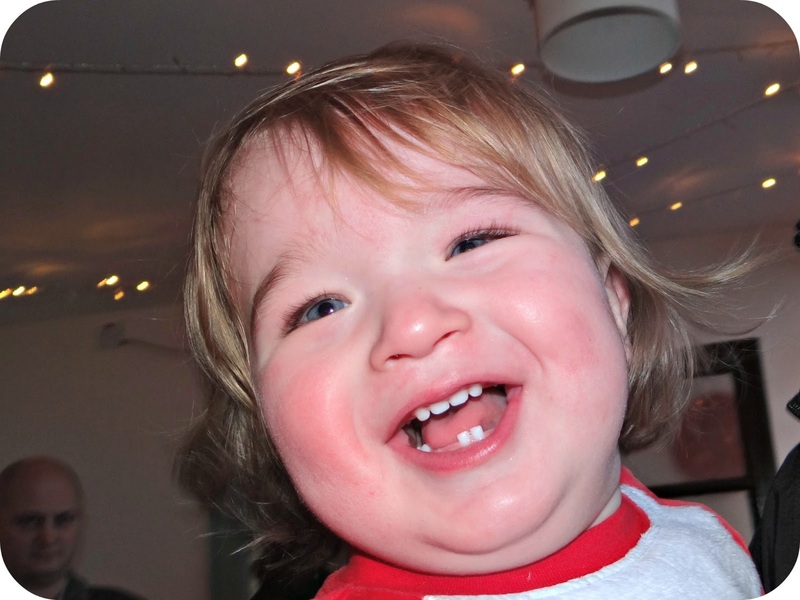 Leo will then pick him up and give him a reassuring pat on the back before putting him into his pram and pushing him around the entirety of the house. Who’s to say that imagination cannot come into play now? Leo has demonstrated that he is playing and making the very most out of his already, even if he is just mimicking learnt behaviour he is still playing make believe and becoming a very clever, well rounded little man. What a lovely post, it's so wonderful to hear about how he plays. He sounds incredibly caring and thoughtful and it's gorgeous to see him with his doll.